IN-HOUSE TRAINING based on revolutionaly Ten3 Business e-Coach - Innovation Unlimited! Ten3 Business e-Coach – Your 360 Achievement Catalyst! Unique source of unlimited inspiration, innovation and growth! Today, we have customers in 100+ countries! Grow from within – exploit your hidden internal capabilities! Written text delivers 10% of the message only. People learn much more from life presentations because 90% of the message is delivered through looks and sounds. Further, most knowledge creation and learning occurs when people are reacting to someone else's thinking. This is why life discussions during training sessions are so important for collective learning. "Whether it's art, science, technology or business, inspiration often comes from being close to the action," writes Tom Kelly from IDEO in his famous book The Art of Innovation. "New ideas come from seeing, smelling, hearing - being there. This sensory immersion is why people still fly to other parts of the country for face-to-face meetings with clients, customers, and colleagues, even in the information age; why phone and videoconferencing often doesn't do it. It's also why people still go to museums, to be inspired in the presence of original artwork, through a digital image may be easily available on their home computer screen." Innovation Unlimited! We help you change the world! New innovation training game! Discover innovation insights! Traditionally, the end of a training course is the end of the guidance by the trainer. The end of our training course is just the beginning of our guidance and your exciting journey. – your 360º achievement catalyst – that will provide you with continuing 24/7 inspirational guidance after the training course is over. By Day 30, we retain 2%-3% of the original knowledge and need to be re-trained. What a waste of our precious resources! Smart Course Materials make learning easy and fast! 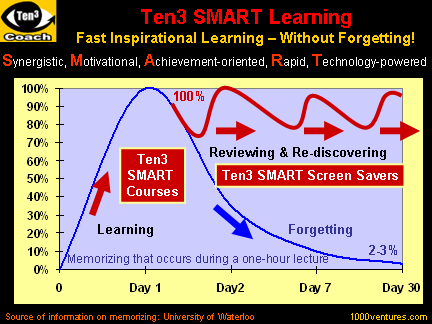 Smart Screen Savers help you reactivate your knowledge and apply it – continually and effortlessly! Click here to see unsolicited "Thank-You" notes from our clients. Kindly book in advance as the time of our key resource persons allocated for training is limited to 8 weeks/year only. The Consultant License allows you to make printed copies of Ten3 mini-courses and disseminate them among your clients. Promotional Power: This web site is visited by 300,000+ potential customers a month. Your contact details will be published in the list of Licensed Ten3 Trainers / Consultants for 12 months at no fee! You can also buy any or all Ten3 self-learning mini-courses!